An Evening at Film Nagar Temple in Jubilee Hills, Hyderabad. Daiva Sannidhanam temple in Jubilee Hills, Hyderabad is popularly known as Film Nagar temple. 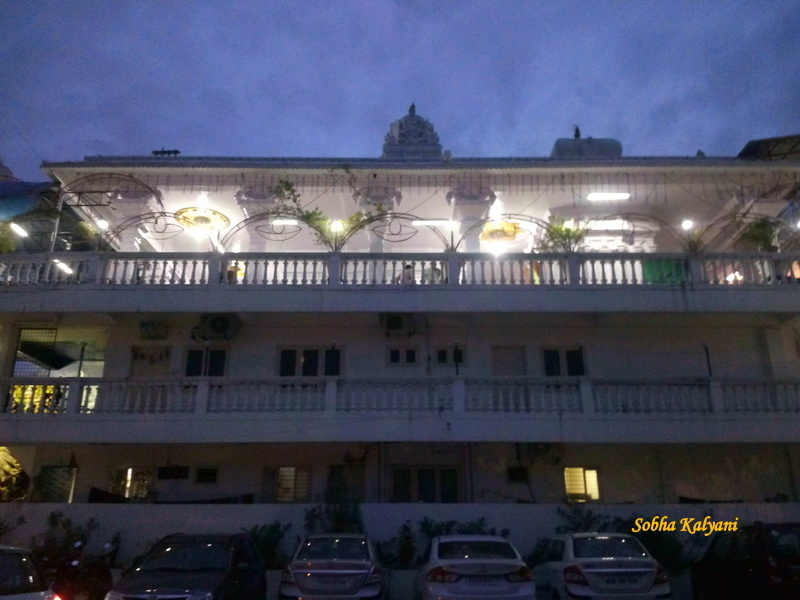 It is located on the busy main road of Jubilee Hills, Hyderabad. It is a temple complex in a small area. The temple remains open to devotees from 6.30 a.m to 11.30 a.m. It remains open till 12 noon on weekends (Saturdays, Sundays) and holidays. Again, it is open to devotees at 5.00 p.m and closes at 8.30 p.m. The temple is located on Rd No.38, Jubilee Hills, Giani Zail Singh Nagar, Film Nagar, Hyderabad. This is one of the tourist attractions of the city besides other top attractions of Hyderabad. On a fine Saturday evening we drove all the way from Banjara Hills Rd No.1 to Jubilee Hills Rd No.38. We could easily get a parking lot in front of the temple premises. Though a weekend, the temple is not heavily crowded. After parking the car, I took few clicks of the temple. Here is one pic where you can see the temple with lighting and the car parking. 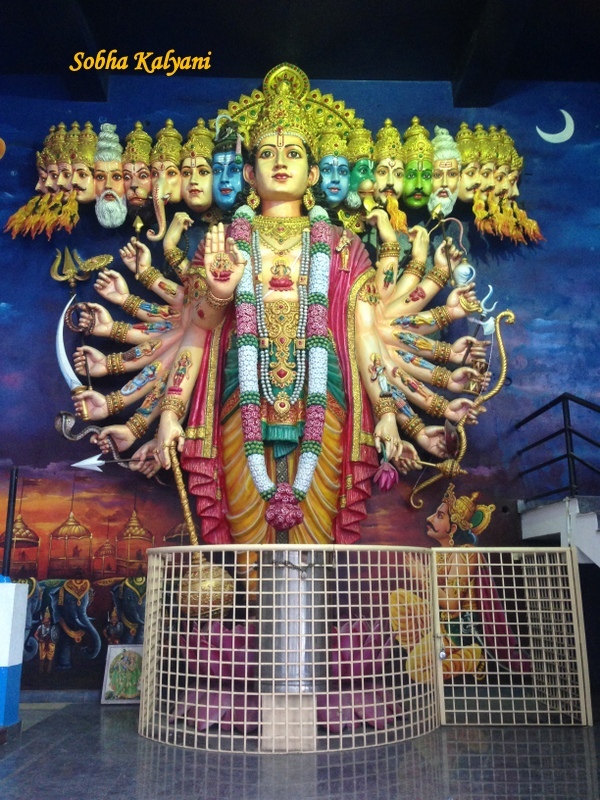 At the entrance, you can see a stunning statue of Lord Vishnu in Viswaroopam i.e the Universal Form of Lord Vishnu.That looked quite magnificent. From this spot you need to climb few stairs to reach the main temple premises. On entering, you can see 'prasadam counter' to your left where you can get tasty laddus and pulihora. Well we don't buy prasad first, but go round the temple complex and have the darshan of various deities in small temples. You can see Lord Mallikarjuna i.e Lord Shiva, Lord Ganesha, Bala Subramanian i.e Kartikeya, Muralikrishna, Lord Venkateswara (the deity in the temple is visible from the main road). This deity of Lord Venkateswara was shown in many Telugu movies. Further up the stairs you can see Ayyappa and coming down the stairs you can see Sri Rama temple and then a huge idol of Veeranjaneya i.e Hanuman. It hardly takes 30 minutes to go round the temple premises and visit all the deities in the mini-temples. There is even Shirdi Sai Dhyan Mandir where you can sit peacefully and meditate for a while. After having the darshan, you can sit to spend some time enjoying the view of Jubilee Hills from the temple which is at a height. The temple is usually not much crowded and no pushes and pulls by the devotees but you can enjoy spending some time at Daiva Sannidhanam for a peace of mind in the ever-busy and stressful life. Though the temple is located in a busy area, you can feel calmness inside the temple premises. On the whole, it was a nice weekend evening with positive vibes at Daiva Sannidhanam i.e film nagar temple in Hyderabad. My Opinion:: A nice place to spend a weekend evening in a divinely atmosphere with positive vibes. One of the best family / lone hang out places in Hyderabad.